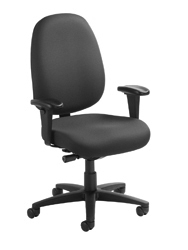 The Carlson chair represents a refreshing task seating solution for offices with plenty of room. The Carlson chair has 2 back styles - High Back and Mid Back. WEIGHT CAPACITY 250 LBS. Overall dimensions of the High Back chair: 30" wide, 27 1/2" deep, 42" - 48 1/2" high, seat height 17 1/2" - 23". Overall dimensions of the Mid Back chair: 25 1/2" wide, 26 1/2" deep, 36" - 41 1/2" high, seat height 17 1/2" - 23". This product is available only in black.